The year 1963 was an era of a more innocent time where the world "gay" means happy, gleeful and jovial. Fast forward to the modern day of the year two thousand and ten and it is a whole different meaning which led me to snicker uncontrollably, much to the displeasure of the people within earshot, who too know what I was thinking. To make matters worse, I had to part them like Moses parted the Red Sea to take a picture of this poster. They were not too amused. For the uninitiated, here's a quick low-down on Malaysia Day and what's so gay about it. We know 1959 and we know 1965. The former was Singapore being granted full internal self-government status by the British Empire. The latter was Singapore's gaining independence as a republic. It must be noted that without Malaysia Day, Singapore cannot complete the jigsaw puzzle and account how we jumped from self government in 1959 to independence in 1965. So it is quite baffling why this particular historical event was left out of our lower secondary history books? 16 Sep 1963 was the day that Malaya, North Borneo (Sabah? 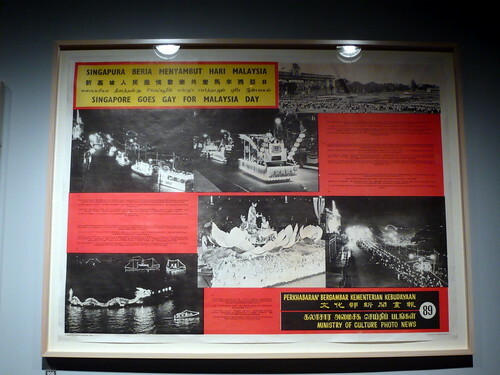 ), Sarawak and Singapore formed the Malaysian Federation or simply put, Malaysia. We sometimes refer our Malaysian neighbours as 联邦人. 联邦 in English means Federation. So now you know how that came about.